I am writing this post for a friend to demonstrate that making caponata is not difficult and I have therefore included many photos. In my first book, Sicilian Seafood Cooking I have written a whole chapter about making various caponate (plural). This one is Catanese, as made in Catania, and the main ingredients are eggplants and peppers, but there are other caponate where the main ingredients are either eggplants or pumpkin or potato or celery (called Christmas caponata). I have also made a fennel caponata. All caponate need to be made at least one day before to let the flavours develop. Caponate are eaten at room temperature. Caponata Catanese is made with eggplants, peppers, celery, onions, chopped green olives and capers. A little sugar, vinegar and a splash of passata are used to make the agro- dolce sauce. Toasted pine nuts (or almonds) and fresh basil make good decoration and add extra taste. Caponata Palermitana, from Palermo, does not include peppers. I used roughly 1 kilo of eggplants and 1 kilo of peppers, 3 sticks of celery (pale green from near the centre), 1 onion. I used about 125g of capers and about the same amounts of chopped green olives. A true Sicilian making caponata would never weigh ingredients and may at times use more eggplants than peppers; these are rough amounts as a guide to illustrate ratios of ingredients. Always use extra virgin olive oil and as much as needed to prevent the ingredients sticking; access oil can always be drained off but bread makes a fine accompaniment to all caponate and the oil is particularly flavourful. Each vegetable is fried separately but I usually combine the celery and the onion at the same time. the vegetables have different rates of cooking and you want to preserve the individual flavours as much as possible. A frypan with a heavy base is good to use. I am making large quantities this time to take to a gathering so I am using my heavy wok (Le Creuset). Fry the eggplants in some extra olive oil and add a little salt. Drain the eggplant in a colander with a container underneath to collect any oil. In the same pan add some new oil and the oil that you have drained from the eggplants. Fy the peppers and add a little salt. Drain them as you did the eggplants, collect the oil and add this to some new oil in the same pan. Fry the celery and the onion. When they have softened but the celery still has some crunch add the green olives and capers. Salt may not be necessary for this component of the dish. Make a small depression in the centre of the vegetables and add about a flat tablespoon of sugar – this varies, some add more, some add less. Melt the sugar (caramelise it) and then add about 3 tablespoons of wine vinegar. Evaporate on high heat. Add a splash of passata. Mix through the ingredients in the pan and cook it for a few minutes. Incorporate all of the ingredients . The caponata is now cooked. It needs to be placed in the fridge in a sealed container till you are ready to eat it and it will not suffer if it is made 3-4 days beforehand. Decorate it with toasted pine nuts and fresh basil leaves when you are ready to present it. There are other recipes on my blog for caponate made with different vegetables. Time and time again I get asked about what I recommend as must-try dishes when in in Sicily. You may be familiar with the websites for Great British Chefs (leading source of professional chef recipes in the UK) and their second sister website – Great Italian Chefs – dedicated to celebrating the wonderful food culture, traditions and innovations of Italy’s greatest chefs. The Italians themselves are fiercely passionate about their culinary heritage, and with good reason – a large number of the world’s best dishes come from the cities, fields and shores of this deeply cultural, historic country. Today, Sicily is one of Italy’s most popular tourist destinations, and it’s the food that keeps people coming back year after year. From Great Italian Chefs comes 10 must-try dishes when you’re in Sicily (29 September 2017). There are really 11 dishes listed altogether as it is assumed that you already know about Arancini. You will find almost all of the recipes for these dishes in my blog and I have added links and some photos to the recipes in this post below. 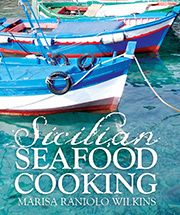 Some of the photos are from my first book Sicilian Seafood Cooking. I cooked the food, the food stylist was Fiona Rigg, Graeme Gillies was the food photographer. Although I have no recipes on my blog for Fritto misto, Raw red prawns and Involtini di pesce spada, I have explained each of these these Sicilian specialties and where appropriate I have links to similar recipes on my blog. Many of you may be familiar with Fritto misto (a mixed dish of mixed fried things: fritto = fried, misto = mixed) and know that it can apply to vegetables, fish or meat. These are cut into manageable size, are dusted in flour, deep fried and served plainly with just cut lemon. The Fritto misto I knew as a child was what we ordered in restaurants and was the one that originated from Turin (Piedmont) and Milan (Lombardy). It was a mixture of meats and offal and I particularly liked the brains. Fritto misto was originally peasant food, the family slaughtered an animal for eating (usually veal) and the organs such as sweetbreads, kidneys, brains and bits of meat became the Fritto misto – it was a way to eat the whole animal and it was eaten as close to the slaughter and fresh as possible. Rather than having been dipped in flour the various morsels were crumbed. Seasonal crumbed vegetables were also often included – mostly eggplant and zucchini in the warm months, cauliflower and artichokes in the cooler season. If we wanted to eat a fish variety of Fritto misto we would order a Fritto Misto di Mare/or Di Pesce (from the sea or of fish). Sicilians are very fond of Nunnata – the Sicilian term used to call the minute newborn fish of different species including fish, octopi and crabs; each is almost transparent and so soft that they are eaten whole. For Sicilians Nunnata is a delicacy but these very small fish are an important link in the marine biological food chain, and that wild and indiscriminate fishing endangers the survival of some fish species. Many Sicilian fishers and vendors justify selling juvenile fish on the grounds that they are ‘bycatch’ (taken while fishing for other species). They argue that the fish are already dead or injured, so there is no point in throwing them back. It seems that for Sicilians, ‘sustainability’ means that all fish are fair game as long as they can catch their quota. However, it is important to acknowledge that the traditional fishing for juveniles is an important activity for small-scale fishers. It only takes place for 60 consecutive days during the winter and therefore has a high socio-economic impact at local level. When in Sicily I refuse to eat this and I only encountered one restaurant in Sciacca that refused to present it to patrons who specifically asked for it. 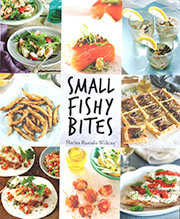 For the recipe of mixed fried fish, select a variety of fish: squid and prawns, sardines/anchovies, some fleshy white fish, whitebait too. Carefully clean the prawns leaving the head attached and removing the internal alimentary canal; clean the squid and cut into rings or strips and gut the sardines /anchovies and leave the head attached if you can. Wipe the fish dry and dip the fish a little at a time into the flour and salt, sieve or shake to remove the excess flour and fry in very hot oil until golden and crispy. I use extra virgin oil for everything. Place on paper to drain and serve hot with lemon wedges and perhaps some more salt. Gambero Rosso, (Aristaeomorpha foliacea) is a Sicilian red prawn. These prawns are blood-red and are generally wild caught in the Mediterranean. All very fresh seafood can be eaten raw and is loved by Sicilians, usually served with extra virgin olive oil and lemon juice. Most times the seafood is marinaded in these even if it is for a short time – the lemon juice “cooks” the fish. I like to eat sustainable fish and although pesce spada (swordfish) is very popular in Sicily it is overfished. There are local variations for the stuffing for Involtini di pesce spada but the most common is made from a combination of dry breadcrumbs, parsley, garlic, grated pecorino and sometimes capers. I have these recipes that are involtini (rolled fillets and stuffed). Pesto trapanese (from Tapani in Western Sicily) is also called Matarocco. Busiate is the type of pasta traditionally made by coiling a strip of pasta cut diagonally around a thin rod (like a knitting needle). I am saddened and distressed to say that recipes for Cous Cous di pesce and Cannoli have disappeared from my blog and I can only assume that because I have transferred my blog several times to new sites these posts have been lost in the process. I will add these recipes at a later date. Great Italian Chefs link to 10 must-try dishes when you’re in Sicily (29 September 2017).